BasicGrey’s Konnichiwa is a bright and girly range that has been used perfectly by Kim to document a day out with the girls to celebrate Melbourne Cup. 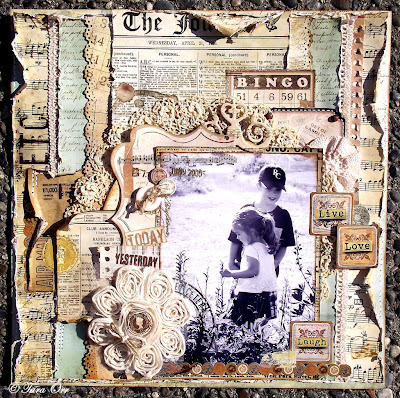 Kim has used a variety of embellishments from the large number in the range to frame her photos without overwhelming them. The papers also proved perfect for fussy cutting allowing Kim to easily layer more flowers onto the base patterned paper design. Meanwhile the soft and ethereal Plumeria range was the perfect backdrop for this spell-casting photo of Suz Doyle’s daughter. 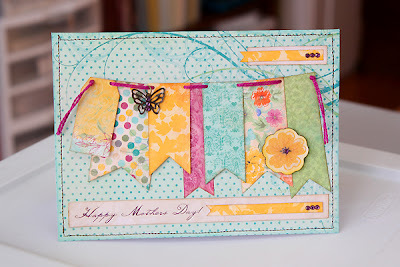 Lilacs and golds are offset by turquoise to create a pretty, dreamy effect and Suz has played with layers and Martha Stewart edge punches to create some interest at the bottom of this page. How cool is this page created by Leeann Pearce for the BasicGrey blog. She has used Kissing Booth in a clearly non-Valentine and very-Leeann happy carefree way. Danielle Flanders has kindly agreed to share this beautiful layout with us using the Konnichiwa range. I love how Danielle has created the quilted pieces from patterned paper to reinforce the theme of her layout. Thanks for sharing Danielle. Ashli Oliver has used the beautiful Basic Grey Piccadily range to great effect. We love Ashli's layered and distressed style. She includes so many interesting details into all of her layouts. Thankyou for agreeing to share your layout with us Ashli. Nicole Samuels from the BasicGrey design team created this page using the What’s Up range, which is due in Aus any day now! We love how she has colour-coded the heart punches to create a background that’s both interesting and still allows the focus to remain on the photos. How cute is this collection Friend’s Furever by WeR memory keepers. When Leeann saw the little 4 x 6 pad she decided that this was going to also be the starting point of inspiration – a mini book. . This mini album was also for her daughter Storm. One of storms dreams has been to own a dog. Now that they lived on a farm her little dream came true. Inside the mini pad, is a mixture of pattern papers and a check list of doggy activities. Perfect for Storm to teach Lexi a few tricks. Leeann has given this mini to Storm with a few extra embellishments she can add when she starts to fill this in. It’s now her little keepsake of a beautiful friendship. Jane loves these We R Memory Keepers 4x6in paper pads as they are perfect for making cards, she used the matching stamp set 'arrow' to enhance the paper then use the speedometer image to create an embellishment. The building background was hand drawn by Jane and the cars were cut from one of the papers. Jane has shown us a very easy way to create a flower for your card using the We R Memory Keepers small stamp set, just select a light coloured ink pad for the solid circle image then stamp the circle motifs on top with a selection of ink pads that match the papers, trim with a circle punch, layer them on top of each other as shown and add one of the fancy metal flower brads in the centre and viola! Pamela Young shares a few projects with us who also has used the "friends furever" collection. We love how the embossed tag embellishments are used to help tell the story. On this card Pamela Young has also used the sew easy stitch piercer - hearts by WeR Memory Keepers. We love how this adds the finishing touch to this friends furever card. Finally, we also love this simple but totally cute idea of embellishing a jar fill with doggy treats using the "Friends Furever" collection. Thank you so much Pamela for letting us share, more of your amazing work. The colours theme of the Vintage Vogue line from Pink Paislee is such a delight! It takes you right back in time but still perfectly blends in with today's photos. In this layout, Iris simply takes a few pieces from the ephemera pack and combines it with a few other elements such as a wooden bike shape and a few gems plus a butterfly and she already has a quick and easy but colourful and detailed layout for her daughter. Here is another example from Iris on how easy it is to make a layout with the Vintage Vogue line from Pink Paislee. Pink Paislee Nantucket could be considered a feminine beach/summer range with the large amount of pink that is used in this range. However, Kim has shown that being more selective about the elements used, it is definitely suitable for the boys and men in our lives too. Kim has used a large selection of the Ephemera to create the cluster on the right of the photo, carrying it across with two layered elements on the left side to bring focus to the photo strip. Also from Kim, also using Nantucket but here she explores the more feminine side of the range as she documents her amazing weight loss journey. This beautiful layout was created by Jessy Christopher - a preschool teacher & an avid scrapbooker in Malaysia. According to Jessy, what she loves the most about scrapbooking is that it allows her the freedom to express herself in a creative form. We think she did that beautifully in this Pink Paislee layout where she created a background with lots of misting. For the journaling, I created lines using paint and also corrugated board. Pink Paislee design team member created this stunning layout using the Sweetness range. We love how she has reproduced a stylised version of the photo on the page with the heart outline and the strips representing the brick walls. This is one of those layouts where the more you look the more you see!